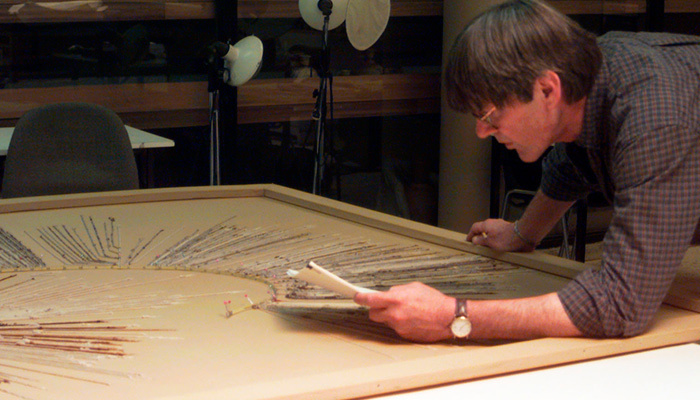 Dr. Gary Urton, studying the quipu Nº 0780 of the Museo Chileno de Arte Precolombino. The scientific study of quipus began early in the twentieth century with the research of L. Leland Locke, in the American Museum of Natural History, in New York, and Erland Nordenskiöld, in the Museum für Völkerkunde, in Berlin. Locke was especially interested in understanding the capacity of quipus to record numerical values, and he explored this aspect of the knotted-string records in relation to possible notations of census data and tribute records. Nordenskiöld focused his efforts on analyzing what he took to be various calendar counts in quipus, although few of his suggestions for calendrical values have borne up under more recent study. The investigation of numerical recordkeeping in the quipus have been carried to their highest level in the work of Marcia and Robert Ascher. From the early 1970s to the present day, the Aschers have produced careful descriptions and numerical analyses of some 250 of the 600 or so surviving samples in museums around the world. The Peruvian scholar Carlos Radicati di Primeglio investigated a number of quantitative and qualitative (esp. color) features of quipus in collections in Peru, while the Chilean archaeologist devotee of quipus, Percy Dauelsberg, pursued important research on several quipus from Inka cemeteries in Mollepampa and Playa Miller, near Arica. The latter work included the description of a pair of the largest quipus known to date. Other, more recent work on quipus has been carried out by Gary Urton and William Conklin who have focused on various quipu construction features, such as the spin, ply and knotting directionality. Another area of important research has involved work by ethnohistorians John Murra, Gary Urton and Tristan Platt on Spanish documents containing transcriptions of quipus made in early colonial times. The principal students of surviving quipu traditions, especially in the highlands of Peru, includes work by Oscar Nuñez del Prado, Carol Mackey and Frank Salomon.